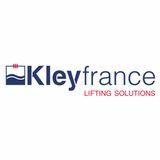 INTRODUCTION ĺź&#x2022;č¨&#x20AC; Founded in 1955, Kley France is specialized in design & sales of lifting equipment and associated services for oceanography and Oil & Gas. 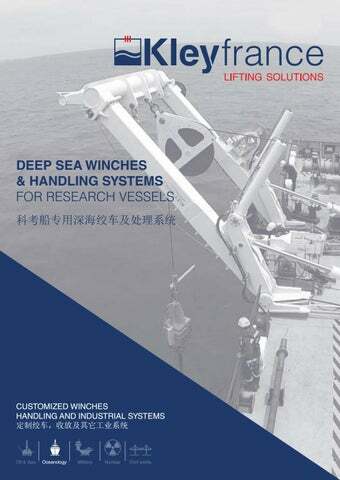 The company has a long tradition in oceanography, where our innovative and pioneering frame of mind has allowed us to develop state-of-the-art deep sea winches and handling systems. Over the past four decades, we have built long-term partnerships with international research institutes and universities. Technology 技术原理 Independent synthetic grooves match perfectly the rope elongation. The grooves and the rope do not slip relatively to each other, in order to reduce the friction of the rope, and to extend its life time. The rope tension decrease on each groove to end up with a very low back tension for winding the rope onto the drum. 5t max. 1.5m/s - 2m/s max. 10t max. 1.5m/s - 2m/s max. 15t max. 1.5m/s - 2m/s max. 20t max. 1.5m/s - 2 m/s max. 25t max. 1.5m/s - 2m/s max. Kley France develops custom-built Launch and Recovery Systems (LARS) with different configurations to meet customer requirements and vessel arrangement. Equipment are supplied with hydraulic motorization, and dedicated HPU. Our LARS can be fully integrated including deep sea winch, alternatively they can also be designed to operate with a wide range of winches as part of ROV package. Since the 80’s, Kley France and the French Polar Institute IPEV (CNRS*) have worked in partnership and developed the CALYPSO corer which is dedicated to take long sediment samples by any depth. The CALYPSO corer has been continuously improved with coring experiences during the last 35 years. Recently, IPEV (CNRS) has developed and patented the acoustic release system which is a major breakthrough in coring technology, making coring easier, faster, more precise and more secure. Coring optimization software (option) 优化软件 CINEMA software was created by IFREMER in Collaboration with IPEV and CNRS-INSU in order to prevent sediment stretching in the upper part of long cores. By modeling and computing the kinematics of the coring operations with data loggers, it allows  To optimize all coring parameters before the operation in order to avoid sediment disturbance  To quantify the quality of the cores, after the operation Data loggers are used on all CALYPSO coring operations on board the R/V Marion Dufresne since 2009. 64m sediment sample by Marion Dufresne II in Gulf of California in 2002. CORER LARS 地质取样器收放系统 Kley France designs Launch and Recovery Systems (LARS) for CALYPSO piston coring, and other coring operations. Proposed solutions are proven reliable and based upon decades of partnership with Research Institutes. Systems are highly customized taking into account numerous parameters such as vessel arrangement, length, weight, type of corer, and client preferences. SUB-HULL SENSOR DEPLOYMENT SYSTEM (TVO) 船底探测设备部署系统 Diver free and easy solution for deployment of transducers 船底探测设备部署解决方案 Our «TRAVOCEAN» supports are worldwide utilized for easy and cost effective deployment of various types of sensors or transducers underneath the hull of a ship, through a vertical well, without the need of diver intervention. The ship is equipped with one vertical well (or several) ensuring a watertight passage between a dry deck (above water level) and underneath the hull. The principle is to handle and deploy the sensor through this well, and to keep it firmly at the correct height and orientation under the hull, for measurement and data acquisition, whilst the vessel is sailing.  Adapted to any type and size of vessels  Handling is extremely safe and easy, regardless of the size of the ship  The system is water-tight, thereby preventing any water movement in the well  Allows to escape turbulences nearby the hull, by means of extension tubes  Can be used at high speeds (7 knots and more)  Rigid and dampened (pneumatic) fastening, thereby minimizing vibrations  Materials insensitive to water and marine corrosion (synthetic material and 316L stainless steel). Synthetic materials are chosen for their very low water absorption (modified PA). CUSTOM PROJECTS 特殊定制系统 Besides «standard products» shown in this catalogue, KLEYFRANCE is capable to develop highly customized systems in order to satisfy specific technical requirements. Based upon our cross expertises gained in other sectors (military, submarines, oil& gaz, nuclear, etc. ), our engineering department can derive innovative and bespoke solutions adapted to most exacting requirements, e.g. :  Higher performances (speed, capacity, control modes, etc.)  Special certifications  Special kinematics  Special criterions : transportation, environment (e.g. very low temperatures, subsea operation), shock and vibrations, extremely EMC immunity, ATEX area, etc. Thanks to our agility and to different partnerships, we can also deploy customized project organization so as to reduce delivery time, to localize part of the activity or supply, to work close to clients and shipyards. POWER & CONTROL 动力及控制系统 Our equipment are turnkey delivered, with customized power and control systems. Motorization can be either hydraulic or electric. In both cases, design is based upon reliable and safe architecture, and supply includes whole necessary items from power supply to control consoles and interconnection JB’s. Operators interfaces 操作界面 Friendly designed for easy and safe use with 3 types of interfaces:  Standalone consoles specially designed for control cabin.  Wireless or wired portable console for local operation  Local control console Human Machine Interfaces involve large displays and touch screen technology. The displays are designed for a safe and easy operation. All parameters are available on dedicated displays accessible by login so that no modification in the PLC program is necessary. Camera for monitoring can also be included and the video is displayed on the HMI. Vessel interfaces Specific interfaces with board data acquisition system are provided in accordance with Client requirements. These interfaces can be: hardwired signals, network communication (fiber optic, Ethernet using standard protocols). Also data logging option can be included for events and measurements records. Also, specific gateway is installed for remote maintenance activities carried out by our support team. 9T corer trigger mechanism Corer handling winch. RV: POURQUOI PAS? 1 coring system comprising one 4t×20m Calypso corer and preparation toolings: socketing machine, machining tool for male/female liner assembly RV: Ocean Researcher V.